What is Japan Auto Auction ? Japan Auto Auctions offer a huge selection of used cars every week. The Japan Car Auction System is the cheapest source of cars in Japan with more than 70 online auctions and 120,000+ vehicles every week. Its really very easy and fast way to buy a vehicle from Japan at best competitive prices with all genuine and accurate information. Welcome to Auto Link Holdings LLC, specialist in export of quality cars from Japan. We are based in Yamato, Kanagawa and visit all the major auto auctions inspecting cars for our clients. Buy your next car through us and have confidence in your purchase. Moreover, the bidding management system developed by 'Auto Link' ensures that the process is flawless and convenient for you. Free Access over 120,000 Cars at Japan Auto Auction! How to Buy from Japanese Auto Auction ? 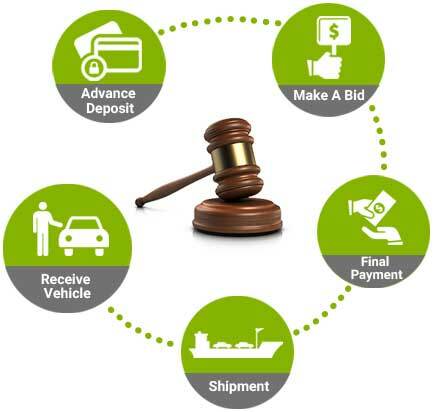 Nowadays, buying is made very simple, easy and prompt through the availability of Reliable Online Auction Houses. Dealers and buyers are able to make a prompt decision of whether to bid on a particular vehicle or not which may save ample of time. We will help you to select and import your own car from the large choice at the online Japanese car auctions each week. We are on YOUR SIDE from start to finish.